The Poor People’s Campaign: A National Call For Moral Revival begins 40 Days of Nonviolent Direct Action to stir the conscience of our country. During these six weeks, The Advocate will offer a reading group for those interested in sustaining our analysis of whiteness and deepening our understanding of Christianity’s role in the history of American racism. 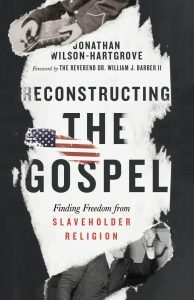 We will read local theologian Jonathan Wilson-Hartgrove’s new book, Reconstructing The Gospel: Finding Freedom From Slaveholder Religion. Two copies are available on loan from the Advocate library. We will discuss the book on Wednesday nights from 7:15-8:15 (except June 13, which is. Reader’s Roundtable night). More info to come!